We take your data privacy very seriously. This page outlines the steps we take to secure your data and how we use it. 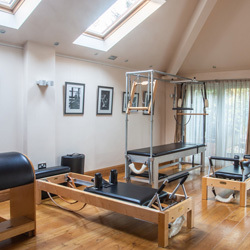 Coolpilates, also trading as Andrew Adamson (sole trader), and Coolpilates Ltd is committed to ensuring the privacy of our clients and other website visitors. In this policy we explain how we hold, process and retain your personal data. 1.2 Contact data / Enquiry data.We may process contact details that you provide to us (“contact data”). This contact data may include your name, address, telephone number and email address, and may be provided through our website, by phone, text or email, if you make an enquiry about Pilates classes, or through our registration form, which we may send digitally to you for completion prior to a first appointment. We will use this contact data solely to schedule classes and appointments for you at our Pilates studio. 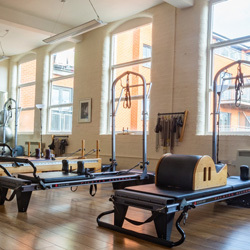 The legal basis for this processing is our legitimate interest in responding to your enquiries to undertake Pilates and to ensure the efficient administration of classes which you wish to attend. 1.3 Profile Data.During the course of providing services to you, you may provide us with biographical information about yourself (“profile data”). This profile data may include your contact data, details of your exercise interests, your occupation and details of your Pilates experience. We may use this data to help you make appropriate choices from our program of Pilates classes. We will not use your data for the purposes of carrying out marketing activities, advertising or promotions. If you opt-in to our mailing list, you will receive occasional emails that may include company news, updates, or information about specialist workshops or classes. If at any time you wish to unsubscribe from receiving future emails, we include detailed unsubscribe instructions appear at the bottom of each e-mail. 1.4 Sensitive Personal Data.During the course of using our services, you may provide us with sensitive information about yourself (“sensitive data”). We will ask you questions about your health and fitness. We ask these questions in order to design a safe program of exercise appropriate to your needs. However, we will only process this sensitive data if you consent to us doing so. 1.5 Website data.We may process data about your use of our website and services (“website data”). The website data may include your IP address, geographical location, browser type and version, operating system, referral source, length of visit, page views and website navigation paths, as well as information about the timing, frequency and pattern of your service use. The source of the website data is our analytics tracking system. This website data may be processed for the purposes of analysing the use of the website and services. We do not use this data for marketing and do not share it with any third parties. 1.6 Notification data.We may process information that you provide to us for the purpose of subscribing to our newsletters (“notification data”). The notification data may be processed for the purposes of sending you newsletters. 1.7 Correspondence data.We may process information contained in or relating to any communication that you send to us (“correspondence data”). The correspondence data may include the communication content and metadata associated with the communication. Our website will generate the metadata associated with communications made using the website contact forms. The correspondence data may be processed for the purposes of communicating with you and record-keeping. 1.8 Other processing activities.We may also process any of your personal data where such processing is necessary for compliance with a legal obligation to which we are subject, or in order to protect your vital interests or the vital interests of another person. 2.1 Our Pilates teachers.We may disclose your personal data to other members of our team of teachers. This is in order to maintain a safe environment for you to work in and to ensure continuity in your Pilates program. We may share your contact data if other teachers are required to teach you at times of annual leave or sickness. 2.3 To comply with legal obligations.we may also disclose your personal data where such disclosure is necessary for compliance with a legal obligation we have to comply with, or in order to protect your vital interests or the vital interests of another individual. 3.1 Personal data that we collect from you will be held for no longer than is necessary. (b) Profile data will be retained for 3 years following the date of our last contact or dealing with you, at the end of which period it will be deleted from our systems. (c) Sensitive datawill be retained for 3 years following the date of our last contact or dealing with you, at the end of which period it will be deleted from our systems. (d) Transaction data will be retained for 3 years following the date of our last contact or dealing with you, at the end of which period it will be deleted from our systems. (e) Website data will be retained for 3 years following the date of our last contact or dealing with you, at the end of which period it will be deleted from our systems. (f) Notification data will be retained for 3 years following the date of our last contact or dealing with you, at the end of which period it will be deleted from our systems. (g) Correspondence data will be retained for 3 years following the date of our last contact or dealing with you, at the end of which period it will be deleted from our systems. 5.4 Your right to access your data.You have the right to ask us to confirm whether or not we process your personal data and, to have access to the personal data, and any additional information. That additional information includes the purposes for which we process your data, the categories of personal data we hold and the recipients of that personal data. You may request a copy of your personal data. The first copy will be provided free of charge, but we may charge a reasonable fee for additional copies. 5.5 Your right to rectification.If we hold any inaccurate personal data about you, you have the right to have these inaccuracies rectified. Where necessary for the purposes of the processing, you also have the right to have any incomplete personal data about you completed. 5.6 Your right to erasure.In certain circumstances you have the right to have personal data that we hold about you erased. This will be done without undue delay. These circumstances include the following: it is no longer necessary for us to hold those personal data in relation to the purposes for which they were originally collected or otherwise processed; you withdraw your consent to any processing which requires consent; the processing is for direct marketing purposes; and the personal data have been unlawfully processed. However, there are certain general exclusions of the right to erasure, including where processing is necessary: for exercising the right of freedom of expression and information; for compliance with a legal obligation; or for establishing, exercising or defending legal claims. 5.7 Your right to restrict processing.In certain circumstances you have the right for the processing of your personal data to be restricted. This is the case where: you do not think that the personal data we hold about you is accurate; your data is being processed unlawfully, but you do not want your data to be erased; it is no longer necessary for us to hold your personal data for the purposes of our processing, but you still require that personal data in relation to a legal claim; and you have objected to processing, and are waiting for that objection to be verified. Where processing has been restricted for one of these reasons, we may continue to store your personal data. However, we will only process it for other reasons: with your consent; in relation to a legal claim; for the protection of the rights of another natural or legal person; or for reasons of important public interest. 5.8 Your right to object to processing.You can object to us processing your personal data on grounds relating to your particular situation, but only as far as our legal basis for the processing is that it is necessary for: the performance of a task carried out in the public interest, or in the exercise of any official authority vested in us; or the purposes of our legitimate interests or those of a third party. If you make an objection, we will stop processing your personal information unless we are able to: demonstrate compelling legitimate grounds for the processing, and that these legitimate grounds override your interests, rights and freedoms; or the processing is in relation to a legal claim. 5.9 Your right to object to direct marketing.You may instruct us at any time not to process your personal information for marketing purposes. In practice, we will not use your personal information for marketing purposes. 5.10 Your right to object for statistical purposes.You can object to us processing your personal data for statistical purposes on grounds relating to your particular situation, unless the processing is necessary for performing a task carried out for reasons of public interest. 5.11 Automated data processing.To the extent that the legal basis we are relying on for processing your personal data is consent, and where the processing is automated, you are entitled to receive your personal data from us in a structured, commonly used and machine-readable format. However, you may not have this right if it would adversely affect the rights and freedoms of others. 5.12 Complaining to a supervisory authority.If you think that our processing of your personal data infringes data protection laws, you can lodge a complaint with a supervisory authority responsible for data protection. You may do this in the EU member state of your habitual residence, your place of work or the place of the alleged infringement. 5.13 Right to withdraw consent.To the extent that the legal basis we are relying on for processing your personal data is consent, you are entitled to withdraw that consent at any time. Withdrawal will not affect the lawfulness of processing before the withdrawal. 5.14 Exercising your rights.You may exercise any of your rights in relation to your personal data by written notice to us in addition to the other methods specified above. 7.1 This website is owned and operated by Coolpilates. Our data protection officer’s contact details are: Andy Adamson, who can be contacted via email: andy@coolpilates.co.uk, or telephone: 0800 206 1911.